Company structures changed dramatically over the course of the last century. The structures and processes behind the production of goods evolved, and with these also the relationships of products and their users. In the craft guilds, the skilled human was the originator of the product, and the focus was on skilled execution, made-to measure for the customer. The powerful guilds owned the monopoly on produced goods, heavily opposed the adoption of the newly available production machines and finally lost their power to mass-production. In the mass production plants of the early 20th century, the machine – and the mechanically acting, unskilled worker – was the originator of the product. The customer focus of the craft guilds disappeared, and Henry Ford famously said that people can have any car they want as long as it is a black model T. Ford profited from a radical innovation, the assembly line, to create economies of scale. But already 1927 Alfred P Sloane of GM introduced a different viewpoint and introduced the “Art and Color Section”, a predecessor of the modern design department. Production was still monolithic, but parallel, customers had a choice, and design was used to differentiate. After the line organisation evolved into a parallel line organisation, the next revolution was to switch lines: Lean manufacturing, pioneered by Taiichi Ohno of Toyota in the eighties, shifted industry focus further to the customer by offering wide product choices, enabled by quick changeover times in production. As the complexity of markets increased, so did the design of organizations. Organizations with a tight coupling between parts – the Fordist assembly line – gave way to loosely coupled organizations with organizational designs fitting better to complex and uncertain market environments: The matrix and networked organization. Customer focus, after having been lost with Fordism, has since Alfred P Sloane reentered organizations. In today’s most developed, loosely coupled, but densely networked companies, the focus on the customer has progressed so much to the core of business that it has gone beyond the focus on the product: The product is now a mediator rather than an end in itself, the final product is the customer experience. Design, in the understanding of an industrial phase, is fixated on the product. In the global economic landscape at the beginning of 21st century, design must take on a new role. Responding to a global market which is characterised by uncertainty, high speed, high complexity and extreme competition, the design of organisations has again evolved. Some advanced companies are again a new, informational form of craft workshops, others are creating experiences through every part of the business. These companies become directors of flows – material, information, and knowledge flows. 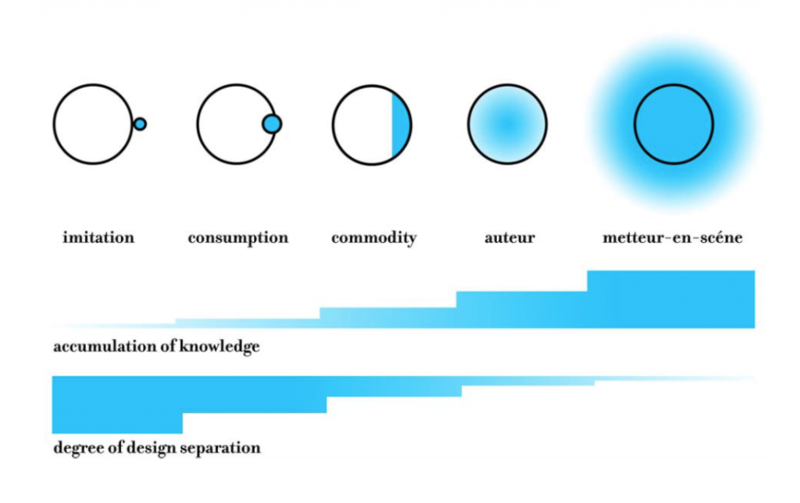 In the stage of informational capitalism, design is utilised to initiate and manage conversations with the market and should be understood as the art of weaving together business processes, services, products, expectations and visions. This most contemporary form of design integration is what I call the metteur-en-scène, the company as stage director. In this type of organisation, design is not a separate factor. It is completely diffused in the company and radiating into the market. Tangible goods are only a part of the final offering. Products, brands and services are interwoven through design as elements to achieve the final goal: the branded, holistic customer experience. However, this model, in which design is suffusing the in- and outside of the organization, occurs only in the most advanced corporations in an advanced state of market economy. So why is it that only a few companies have adopted this form of using design as a genuinely strategic factor? It can be assumed that businesses must have an interest in the optimal organisational utilization of design. In the current phase of informational capitalism, one of design’s strengths becomes important: Its ability to deal with complex situations, uncertainty and “wicked problems” can be vital for succeeding. Yet business managers still often understand design as a business function on the periphery of the organization. The main reasons for this are, firstly, that designers and managers speak different languages, have different worldviews and outlooks. Secondly, design is generally happening in an implicit way, while management needs explicitness. The third reason is the classical, industrial-phase understanding of design, which unfortunately also many designers themselves still advocate: That it is a discipline focused on products, thus being a part of product development and marketing, but not of strategy. This are typical characteristics of the “design as commodity” stage which I will explain further below. Design can be of great value if integrated into business strategy in complex markets. Managers however often perceive it as part of the problem rather than part of the solution – design is regarded as something difficult to understand, difficult to deal with, and at the periphery of the organisation. While a select range of successful companies are “breathing” design, many companies do not. The reason is that predominant paradigms are shaped by history, resulting in beliefs and education systems creating a considerable time lapse between reality and actual approach. While the evolution of companies, formed by rapidly changing market environments, can be a matter of years, time lapses in education take much longer. In many design school curricula, design is still taught as defined by an early 20th century understanding with divisions according to materials or paradigms focused on ideologies of function. But the realities of a globalized economy -what Manuel Castells calls “informational capitalism”- are far ahead of these historical paradigms. In line with the economic development of different global regions, market realities have shaped new models of design integration. It is not sufficient to acknowledge only organisational models which are obviously geared towards design. For a realistic description, every type of relationship, contact and overlap between design and an organisation has to be considered. The two main models for design integration are Fairhead’s design integration steps from 1988 and Boisot’s model from 1995, based on contextual complexity and design constraints: Boisot proposed a matrix with 4 quadrants defined by contextual complexity and design constraints: 1) Where contextual complexity is low and design constraints are few, design is “self-expression”. 2) Where contextual complexity is low and design constraints are many, design is described as “routine”. 3) Where complexity is high and constraints are few, design is seen as a “political process”. 4) And finally, where complexity is high and constraints are many, design is “technical problem solving”. 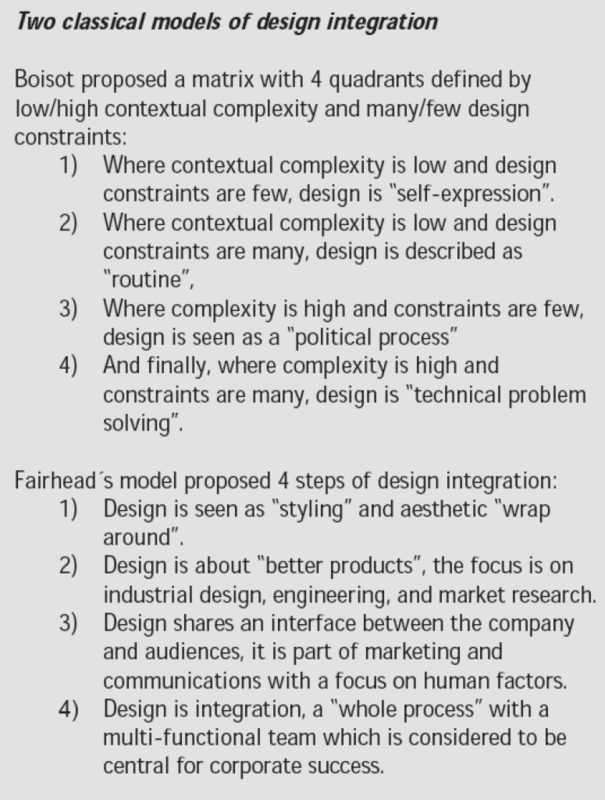 Fairhead’s model proposed 4 steps of design integration: 1) Design is seen as “styling” and aesthetic “wrap around”. 2) Design is about “better products”, the focus is on industrial design, engineering, and market research. 3) Design shares an interface between the company and audiences, it is part of marketing and communications with a focus on human factors. 4) Design is integration, a “whole process” with a multi-functional team, which is considered to be central for corporate success. I suggest that, in step with the development of the market economy, design integration progresses through five organisational states which link design and economic development through specific types of design adoption in companies. Fairhead’s design as “styling” evolved into “design as consumption”. Fairhead’s “design for better products” and “design for communication and marketing” collapsed into a type which I call “design as commodity”. “Design as a process”, the top end of Fairhead’s scale, is, in the meanwhile, appearing in a form of business I call auteurs. Two other types have until now been left out in design integration models: One is the metteur-en-scène on the top end of the scale, an advanced organisational design which only emerged in the last years. Since China’s ascent to a global economic power, another type has become important: “Imitator” companies are now responsible for up to 7% of goods produced globally. By plotting down significant changes of organisational designs as they impact design integration, the result is a timeline of economic state changes. A significant feature of this model is the realisation that the progression of design occurs from an element outside the boundaries of the firm via steps of partial integration to finally a fully dispersed and emanating state which transgresses the boundaries of the firm. This progression happens in the most advanced companies more or less parallel to changes in economic development through an increase in knowledge (of management, strategy, processes, customers, markets etc.) and a simultaneous decrease in the degree of separation between design and the organisation. In other words, once the knowledge in an organisation accumulates so that it successfully copes with the pressures of advancing economic stages, design, if integrated strategically, becomes gradually more important, taking center stage at an advanced level, and even further increasing in importance by finally transgressing the firm and its market. Changes in economic systems do not happen overnight. New, better adapted organisational designs are achieved as states of punctuated equilibrium with phases of disruptions in between states. Thus, when economic change suggests a new organizational structure, it will at first be adopted only by a couple of companies having suitable capabilities. Only after a phase of trial and error and a considerable delay, the fittest stage of design integration will emerge and over time become widely accepted. Thus until recently the most adopted stage in Europe and the US was the “design as commodity” stage which was firstly adopted in the nineteen-seventies. This role is now slowly being taken over by a new form of OEMs, integrated production companies which offer design as an additional service. As a consequence, many corporations are now gradually leaving the commodity stage and evolving towards metteurs-en-scène – the creators of ecosystems – at the top end of the scale. At the bottom of organisational evolution is a state without any design involvement: OEMs are by definition completely foregoing design knowledge, producing design without reaping the added value of design themselves. The largest part of the profit goes to the OEM’s customer, the brand which invests in design, while the surplus remaining with the OEM results solely from cheap labor and economies of scale. But the step from OEM to the first stage of imitator is small: Firms that produce designs for global brands in their function as OEMs often at the same time imitate these products for the domestic market. Imitation goods manufacturers attribute their profit to the fame of the imitated goods. That way, the imitation stage is a first step of learning that what adds value is consisting to a large part of brands and design. There is no shortage of companies engaged in imitation: The World Customs Organisation states that up to 412 billion Euros annually are made with imitated goods, amounting to 5 to 7 percent of global trade in merchandise. The US alone attributes 20 billion annual costs to copyright infringement by imitated goods, 65 percent of which are made in China. Others estimate a full third of Chinese product output to be imitations. Imitation businesses accrue profit by mimicry, counterfeiting well-known brands without building up a sustainable brand themselves. As building brands is a time-consuming process in which companies are also forced to deliver increasing quality, imitation is an attractive tactic for businesses without the willingness, patience and knowledge required to build up their own value proposition. H&M, the Swedish fashion company, is an example of a company which started as an imitator. With the refinement of its business strategy and the building of its brand, H&M is now steering towards becoming a metteur-en-scéne. Also in larger economic terms, the examples of Japan and Korea suggest that the imitation model is a beginner stage of organisations. Organisational learning and the development of brands and design go hand in hand: Once an organisation has achieved a sustainable brand and accrued the market knowledge coming with it, it will unlikely go back to imitation – the value added by the brand reinforces business forms built on brands. It is thus to be expected that in several years, once Chinese companies have succeeded in building global brands, the current imitation model will cease in popularity. The production as consumption model is at work whenever design is utilised in a superficial, random fashion. The design decision process, defined largely by hints and hunches, has few strategic merits. By definition, this model is detached from the individual characteristics and capabilities of a corporation, foregoing the development of an own value proposition which can crystallise in a distinctive design language and ultimately a branded experience. This model is in Europe mostly found in SMEs with little knowledge of design. A special form of the “production as consumption” model is currently thriving in China. There, specialised design firms put together large catalogues of styles for different product groups, selling pre-made product design templates, often through local intermediaries, right out of the catalogue to large manufacturers. In choosing designs out of catalogues, these companies are acting as “amateur” consumers, similar to hobby tailors sewing a dress out of a pattern. This model is an adaptation of the model found in the West. While there it is mostly found in smaller companies with little strategic skill, it is adapted to the larger Chinese companies by multiplying the designs on choice. So the size of the company does not contribute to an improvement of the design process, the analogy is more basic: Large companies get a larger choice of – still random – designs. Reasons are historic – many Chinese companies, while being large, have not yet accrued sufficient knowledge. The design studios engaged in the “catalogue-design” business are mostly based in Asian countries which years ago have gone through similar economic boom years themselves and thus already have experience with companies at that stage. In large markets, this model works only as long as the target market is still undersaturated, consumers are, in comparison, less sophisticated in their demands, and production costs are low enough to absorb the profit offset incurred by the weak link between design and company. In the classical line organisation, design is not an integral force but a separate sub-part. These companies are characterised by functional divisions and clear lines of authority, and design is seen as a fragment, located separately, a component of either engineering or marketing. For companies at this stage, a product is essentially an engineering challenge, and design is seen as one component towards optimised products. Value is created by efficiency and optimisation. This role is challenged by advanced OEMs or service-producers. Quanta Computer is the world’s largest notebook producer, manufacturing laptops for Sony, Apple, IBM, Sharp, HP, and Dell. It excels by providing a highly efficient production service through flexible manufacturing lines. For Quanta, which itself is increasingly contracting out to lower-end OEMs in mainland China, an order takes 2 days to manufacture. Yet, every production optimisation inevitably hits a limit: Due to shrinking profit margins, advanced OEMs now also offer engineering and design services. To compete at this end, US-based Flextronics, an advanced OEM specialising in electronic devices, has purchased the product design firm Frog. With advanced OEMs moving into the territory of line organisations, line organisations have a choice of either moving down or up the scale: Dell, as a distribution- and price-focused company, is outsourcing most design work for notebooks and electronics. It is essentially an OEM distributor with added brand value in an advanced “production as consumption” stage. Others are opting for the higher end only: the auteurs. Auteur design Several companies have adopted a model of design integration which I call the “auteur” model. It shows characteristics of craft shops before the first industrial revolution, transferred into informational capitalism. The “auteur” company is design-driven, focusing on concept and skill. There is an attitude to see the product as an art form driven by craftsmanship, quality, spirit and inventiveness. The designed product takes center stage. At the outset, these companies are hardly present in the mass market, doing well within niches among specially defined target consumers who are ready to pay for skilled craftsmanship, a special origin, or a special story, as tokens for prestige value understood only by adepts. If successful, these brands develop into well-regarded specialty brands with a larger market coverage such as the fashion company Zegna, the tableware producer Alessi, or the coffee producer Illy, all of which are also distinctively Italian. The country of origin, as a culturally charged factor for distinction, is an important component for “auteur” products. This value will for the foreseeable time be a major advantage for countries with a strongly positive image such as Italy, Germany, or France. The Italian senate even discussed the introduction of a brand “Fully made in Italy” to indicate that a product was designed and made in Italy. In the fifth stage, design becomes a systemic capability, and the company, just as a movie director, plans, conducts, and delivers a thoroughly design-driven, branded experience. Mise-en-scène, an expression from French movie and stage directing, means to put up a scene on stage. It is a network of relationships between actors, objects on stage, and the audience. Organisations at this stage are more likely loosely coupled and densely networked than strictly divisionalized, perceiving business essentially as a design problem – open-ended, multi- dimensional, multi-sensory, and weakly defined. Take for instance Porsche: The company, formerly an “auteur”, is producing only 10 percent of every Porsche delivered. Porsche’s focus is the “Gesamteindruck”, the holistic impression of its products. To reach this end, it undertakes only the last 10 percent of the production job itself – it assembles its Porsches from individual parts, all made by OEMs. Every assembled Porsche is then test-driven by an experienced driver who knows – through his ears, his nose, and his bottom – how a Porsche should feel. Only when the Porsche-to-be passes the ‘Porsche feel test’, it is delivered to the customer. Of course, there is top-of-the-range technology and engineering in it, but also other car brands have access to that. Porsche’s real asset is the Porsche feel, embodied in its brand. And Apple: The iPod and iTunes have reaped 70% of the online music market within 2 years from its entry into the market. Before Apple’s entry, music production companies struggled for years with the changes brought about by the Internet, putting efforts into all sorts of defence against music downloading and file-sharing tools. Instead of seeing that the Internet opens up new avenues for delivering music which are happily embraced by consumers, the music production companies pinned their strategy on refusal. Electronic hardware, on the other hand, was overloaded with buttons and functions. Companies in the electronics industry, mostly set up as divisionalised organisations, commonly believed that electronic products are essentially differentiated by functions: The more there are, the higher the price. This led to a mind-lock in which electronic hardware with less functions would inevitably only be able to be sold for a lower price, a frightening idea in an industry beleaguered by constantly dropping profits. This was an opportunity, Apple saw it and redesigned the experience of acquiring and listening to music. More than a hardware or software product together, it is interwoven to deliver a consumer-oriented, design-driven, and branded experience. Companies at that stage have realised that design is about complimentarity. They are orchestrating relationships, excelling in the complex and uncertain market conditions brought about by informational capitalism. Value is created by integration, effectiveness, knowledge, adaptation and constant learning. By collaboration and the combination of product, service, delivery, and brand, holistic experiences are created from a multitude of parts. Yet the result is more than the sum of its parts and hence difficult to imitate, let alone surpass. This paper was first published in Fall 2005 in Designmatters by Danish Design Center (DDC) as ‘Imiteret, kommercialiseret, oplevet: Sammenkædningen af design, virksomheder og denverdensøkonomiske udvikling’. This entry was posted in Design, Economy by Mario Gagliardi.